The musculoskeletal system consists of the muscles, bones, cartilage, and joints. This system provides the body with support and movement. Also, the musculoskeletal system protects major organs, produces red blood cells and store important minerals such as calcium and phosphorus. A properly functioning musculoskeletal system is important for a patient to perform activities of daily living (ADLs). 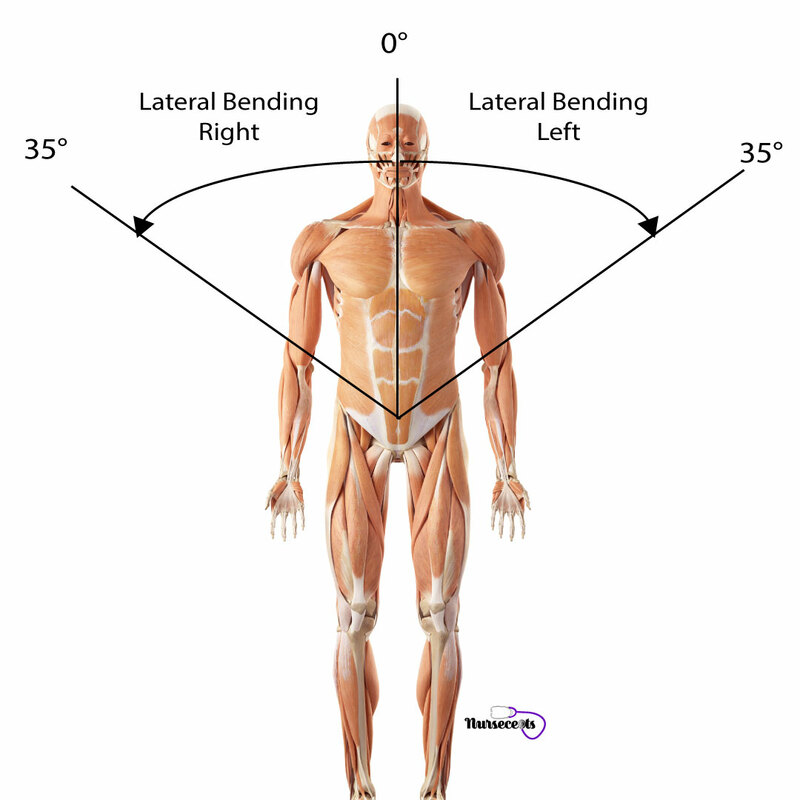 The techniques for the assessment of the musculoskeletal system are inspection, palpation, and observing the range of motion of the joints. 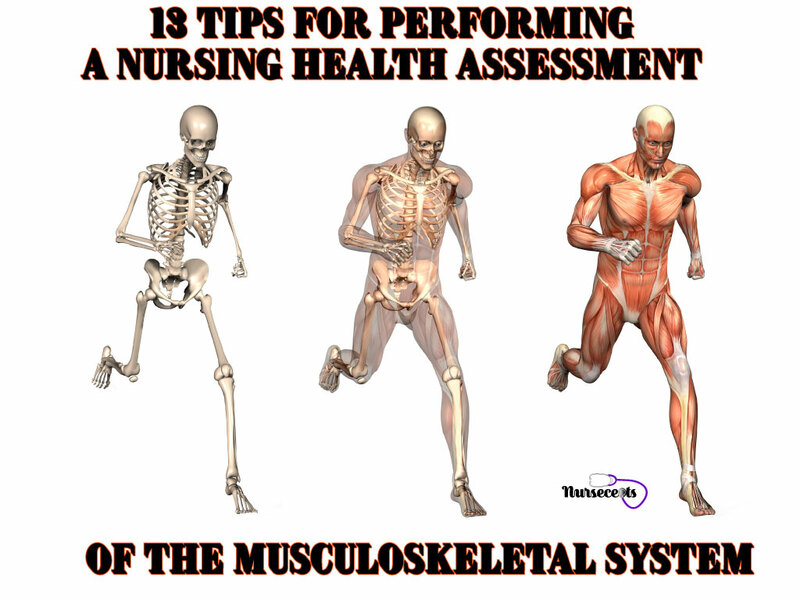 This article contains 13 tips for Performing a Nursing Health Assessment of the Musculoskeletal System. Tip #1 – Gather Information about the Patient’s History. Have you had any recent trauma? Have you had any past surgeries? Do you have any problems with mobility? Have you noticed a change in your gait or the way you walk? Have you been diagnosed with any health condition related to your musculoskeletal system? Do you have a diagnosis of osteoarthritis or rheumatoid arthritis? Do you have any bone or joint deformities? Have you ever had a diagnosis of any congenital deformities? Tip #2 – Gather Information on Chief Complaints or Symptoms. Some major complaints of the musculoskeletal system include pain, swelling, stiffness, and inflammation. The most common areas of pain include the neck, the back, and the joints. Ask the following questions about general pain. Did the onset of pain happen all of a sudden or over a period of time? If the pain came on all of a sudden, was there an injury related to the pain? Has the pain steadily increase in severity over a period of time? Do you have pain constantly or off and on? Is the pain worst at certain times? (Morning? Evening)? Does the pain keep you from performing your usual activities? Is the pain related to certain activities? Do you become easily fatigued when performing usual activities? Do you have any other symptoms related to the pain? Is there anything that relieves the pain? On a scale of 0-10, how severe is your pain? Ask the following questions about neck pain. Do you have any pain in your neck? Does the pain radiate to your arms? Is there any numbness in your arms? Does the pain radiate to your legs? Is there any numbness in your legs? Ask the following questions about joint pain. Do you have pain in any of your joints? Do you have pain in more than one joint? According to the American Chiropractic Association, approximately 80-85% of the population will experience back pain at some point in their lives. Most of the time back pain will not have any underlying cause. When assessing for back pain use open-ended questions. Ask the following questions about back pain. Does the pain radiate to the lower extremities? Is there any numbness in the lower extremities? Does the pain radiate to the buttock area? Assess for swelling, stiffness, and inflammation. Usually, with swelling or stiffness, the patient will have a loss of range of motion. Swelling is normally associated with an articular joint. Stiffness is normally associated with pain in the joints especially with movement. Inflammation can be associated with systemic disorders. Ask the following questions about swelling and stiffness. Do you have stiffness early in the morning? Do you have stiffness or swelling after strenuous activity? Does the swelling or stiffness affect your ability to walk, run, stand from a sitting position, climb stairs, or use your hands? Do you have pain in your joints associated with movement? Ask the following questions about inflammation. Asses the area of swelling or stiffness for redness, warmth, and tenderness. Ask the patient if they have a fever, chills, rash, or weakness. These symptoms can be associated with conditions such as rheumatoid arthritis. Tip #3 – Perform Inspection of the Musculoskeletal System. 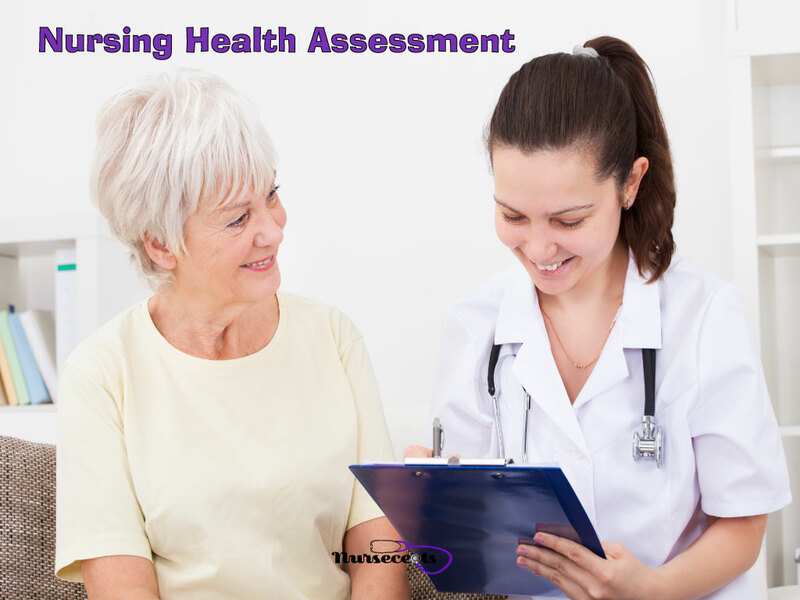 A nursing health assessment of the musculoskeletal system involves inspection of the joints. Use inspection to assess the joints for symmetry. A problem in one joint can mean trauma. A problem in more than one joint can mean a systemic condition. Note the patient’s movements when performing the range of motion maneuvers. The movements should be smooth. Check for joint deformities, muscle atrophy or abnormal positioning of the limb. Assess for immobility in all joints. Inspect the area for redness. Listen for an audible crunching sound resonating from the joint. This sound indicates crepitus. Crepitus can also be palpated. Note the position of the patients head and neck. Assess the patient’s gait. A waddling gait could indicate a hip problem. Note how the patient bears weight on each side as they walk. Note the swing of the leg that is not bearing the weight as the patient walks. Assess the knee as the patient walks. The knee should be extended when the heel strikes the ground and flexed when the leg is swinging. Note how far the patient’s feet are apart while standing. The normal width is between 2-4 inches. Tip #4 – Perform Palpation of the Musculoskeletal System. 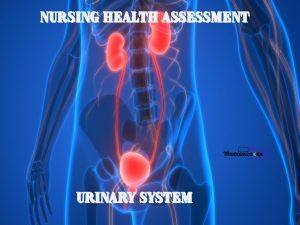 Also, a nursing health assessment of the musculoskeletal system involves palpation of the joints. Palpate the joints and assess the temperature of the skin and the muscles. Palpate for warmth, tenderness, swelling or masses. If pain or tenderness are noted, further assess to specify the joint or structure involved. If there is any pain proceed carefully. Use the back of the hand to palpate for warmth. Compare the affected area with an unaffected area. 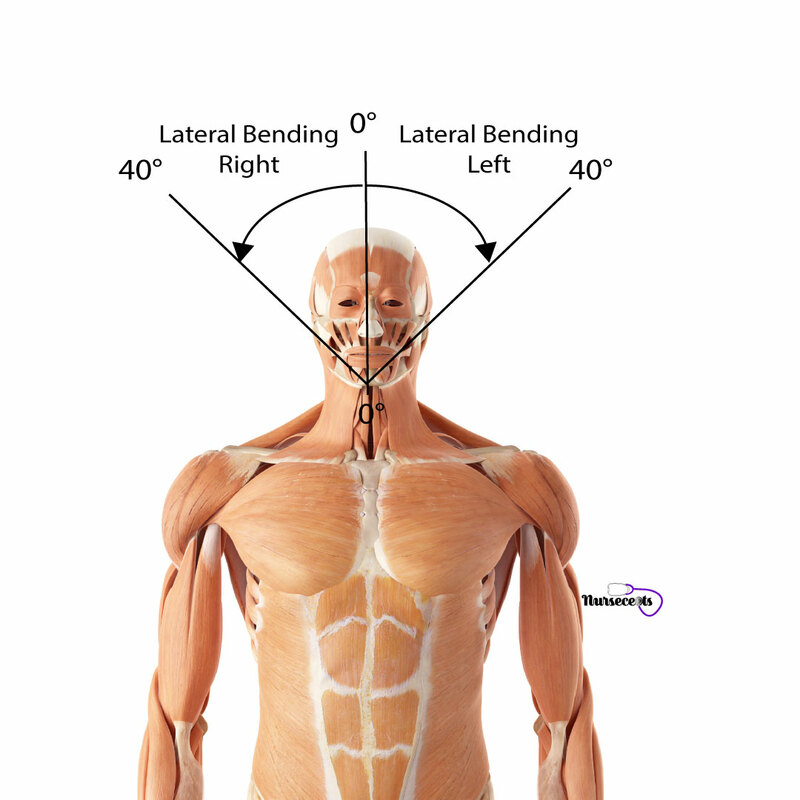 Palpate the bony landmarks of each joint. Assess each area for pain. Palpate each area for swelling especially in the synovial joint area. If you need a list of the synovial joints click here for the article 7 Facts About the Skeletal System Every Nursing Student Should Know. 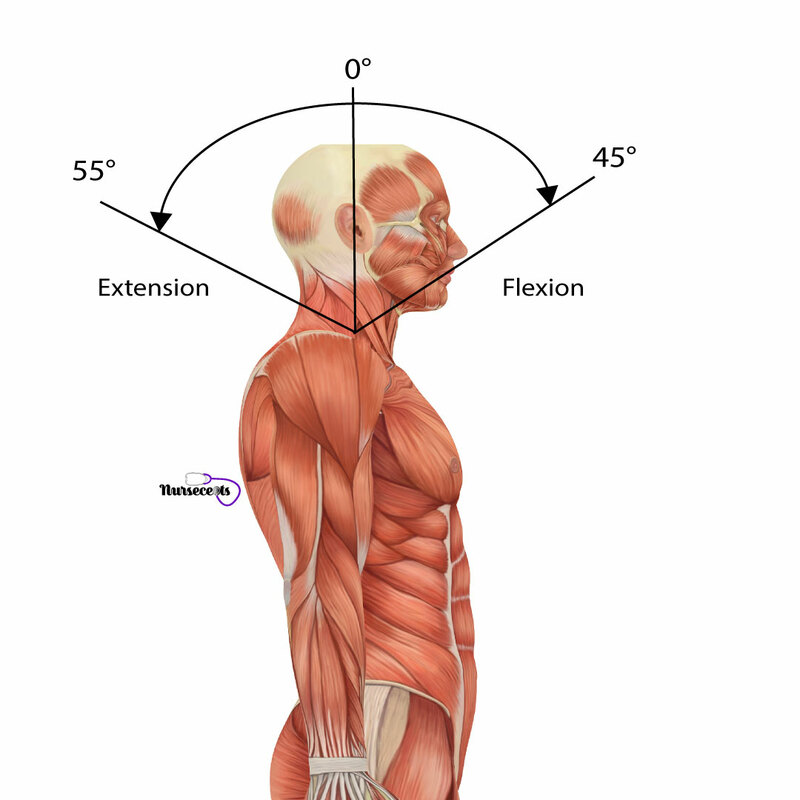 Tip #5 – Assess Range of Motion (ROM) – Shoulder. Assess the shoulder joint for six (6) different movements. 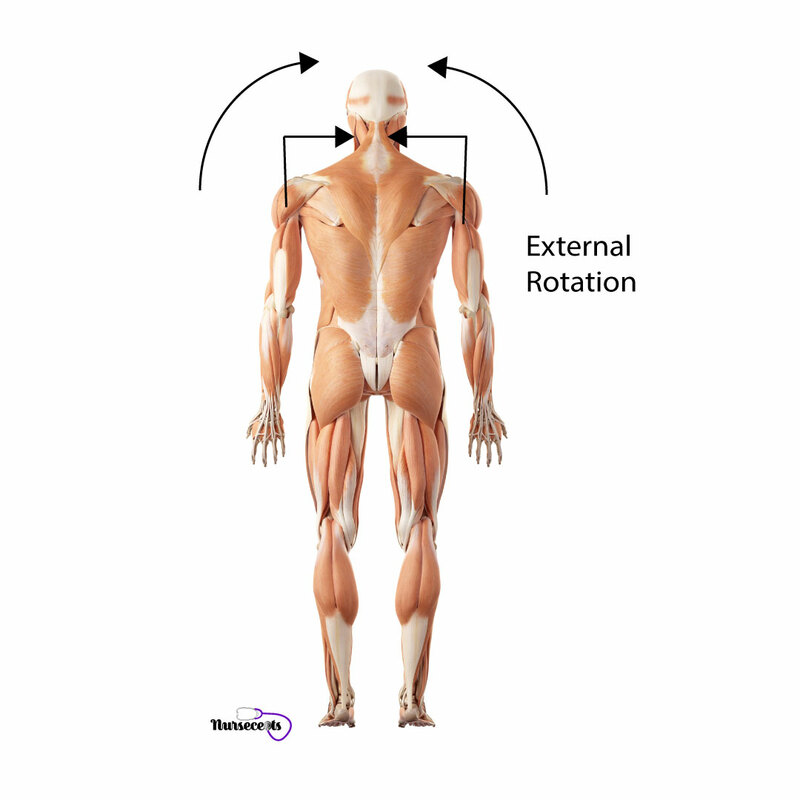 Those movements include extension, flexion, adduction, abduction, internal rotation, and external rotation. While the patient is performing theses movements observe the smoothness of the patient’s movements. Have the patient stand in front of you with their hands at their sides and follow your instructions. Make sure that the movements are performed on each side. With the elbows extended, have the patient to raise their arms forward to 90 degrees and over their head to 180 degrees. With the elbows extended, have the patient raise their arms backward 80 degrees. With the elbows extended and at the patient’s side, have them move their arm across the front of their body to 90 degrees. With the elbows extended and at the patient’s side, have the patient move their arms out to the side 90 degrees and then over their head 180 degrees. With the elbows extended and at the patient’s side, have the patient move their arms behind their back, bend at the elbow and attempt to touch the opposite shoulder blade. With the elbows extended and at the patient’s side, have the patient raise their arm, bend the elbow and clasp the hands behind the head. 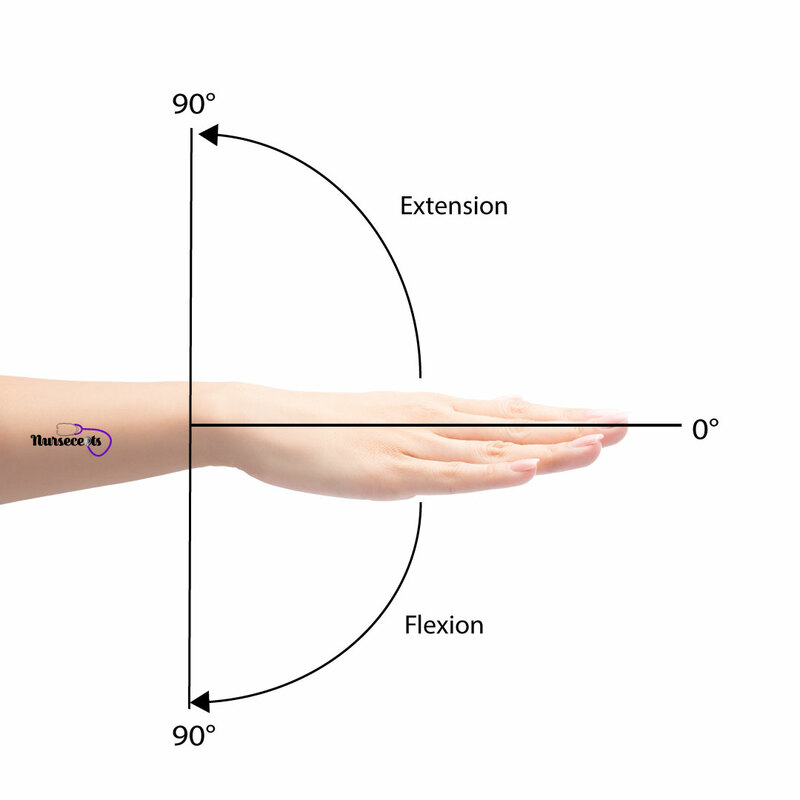 Tip #6 – Assess Range of Motion (ROM) – Elbow. Assess the elbow joint for four (4) different movements. Those movements include extension and flexion of the elbow. Also, additional movements include supination and pronation of the forearm. Have the patient straighten the elbow. Have the patient bend the elbow. Have the patient extend the arms forward in front of them and turn the palms up as if to carry something. Have the patient extend the arms forward in front of them and turn the palms down. 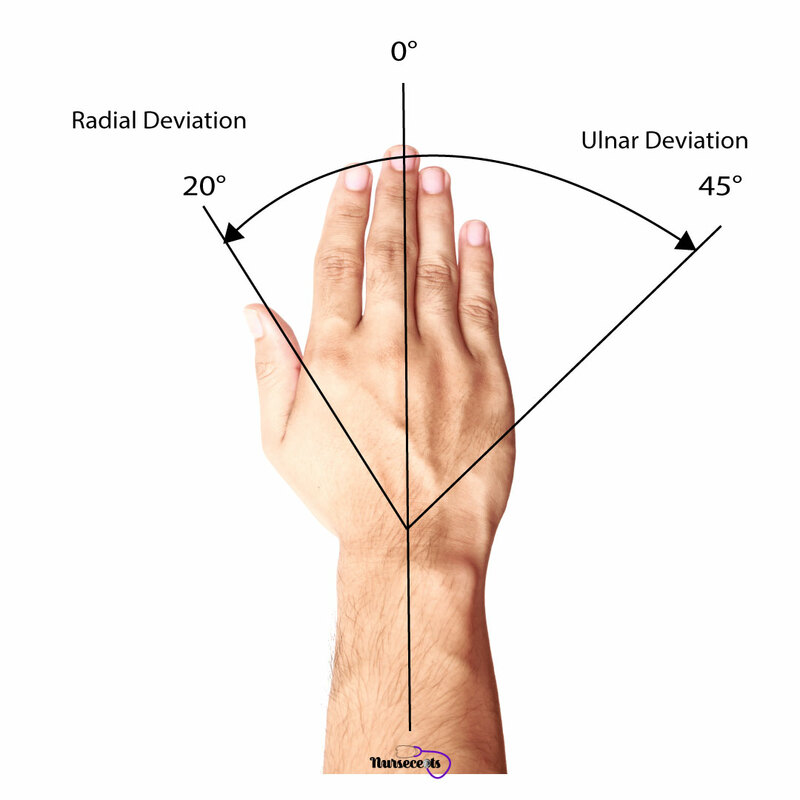 Tip #7 – Assess Range of Motion (ROM) – Wrist and Fingers and Thumb. Assess the wrist for four (4) different movements. 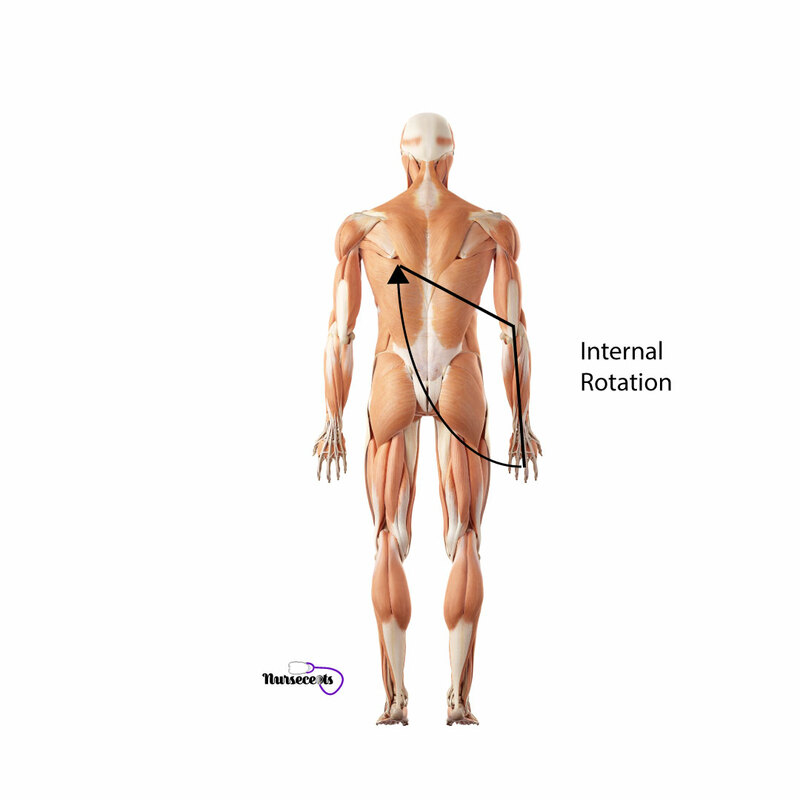 Those movements include extension, flexion, ulnar deviation, and radial deviation. Also, test the fingers for four (4) different movements. 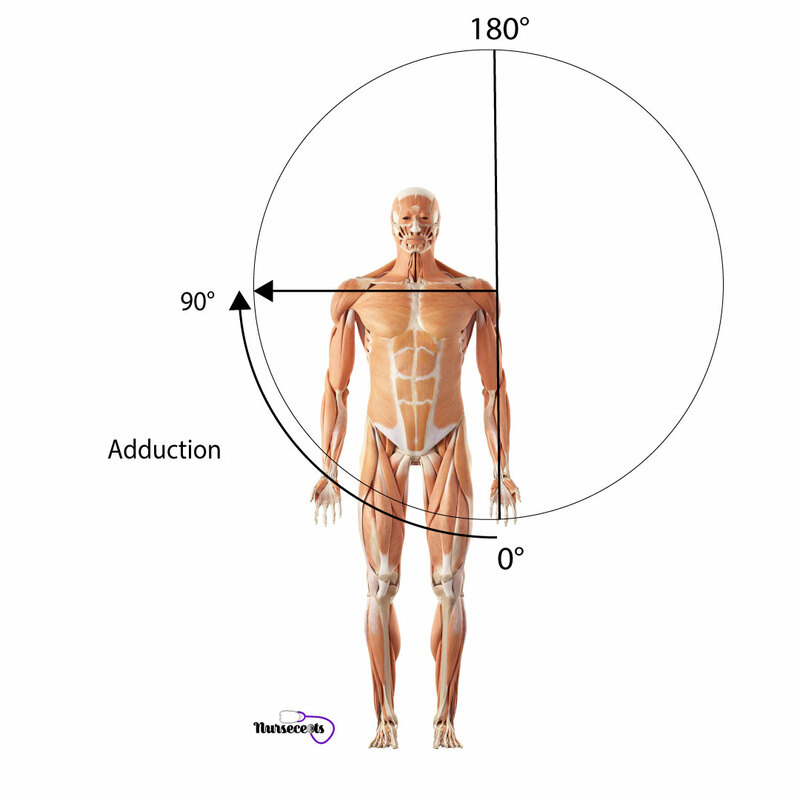 Those movements include flexion, extension, abduction, and adduction. Test the thumb for flexion, extension, abduction, and adduction, and opposition. Have the patient extend one arm in front of them with the palm down. Then, have them point their fingers to the ceiling bending at the wrist. Have the patient extend one arm in front of them with the palm down. Then, have them point their fingers to the floor bending at the wrist. Have the patient extend one are in front of them with the palm down on a surface. Then, have them move their entire hand from midline toward the fifth finger. The movement should be up to approximately 45 degrees. Have the patient extend one arm in front of them with the palm down on a surface. Then have them move their entire hand from midline toward the thumb. The movement should be up to approximately 20 degrees. Have the patient extend their arm and make a fist with the thumb over the knuckles. Have the patient straighten the fingers out from the fist position. Have the patient extend the arm and the hand, then spread their fingers apart. Have the patient hold out their hand with their fingers together. Then, have them move their thumb across the palm and touch the base of the fifth finger (toward the ulnar side). Have the patient hold out their hand with their fingers together. Then, have them move their thumb away from the hand as far as possible. Have the patient hold out their hand with the palm up. Next, have them move their thumb away from the rest of the hand upwards (abduction) and back down with the hand (adduction). Have the patient hold out their hand in front of them and the palms up. Next, have the patient touch their thumb to each of the fingertips. Tip #8 – Additional Assessments of the wrist, fingers, and thumb. Assess the strength of a patient’s hand by performing the Hand Grip test. This is also a great assessment to perform during a neurological assessment. This movement tests the function of the muscles and joints of the fingers and wrist. To perform the hand grip assessment, have the patient grasp two of your fingers on each hand and squeeze. When a patient has decreased grip, the results are positive. A positive result means weakness of the muscles of the hand and or wrist. Further assessment is necessary to find the cause. The Finkelstein’s test assesses thumb movement and function. When performing this movement assess for any pain in the wrist on the thumb side of the hand. Pain when performing this maneuver can be an indication of a repetitive movement problem such as Quervain’s tenosynovitis. To perform the Finkelstein’s test have the patient bend their thumb to the palm of the hand and grasp the thumb with the fingers of that hand (make a fist). The test is positive if there is any pain in the wrist. The Tinel’s sign is used to test for nerve irritation. 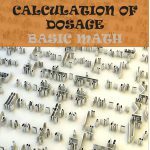 It is commonly used to test for Carpal Tunnel Syndrome although the test is not always definitive. To perform the Tinel’s sign, with your fingers lightly tap over the area you which to test. For Carpal Tunnel Syndrome this is usually the median nerve which is located in the inner wrist. A positive test will elicit numbness or tingling along the distribution of the median nerve which will usually be the thumb, index finger, and middle finger. The Phalen’s test is another test used to determine Carpal Tunnel Syndrome. Like the Tinel’s sign, it is not always definitive for diagnosis. The Phalen’s test assesses for median nerve compression. To perform the Phalen’s Test have the patient place the back of their hands together in front of their body with the wrist flexed. Have the patient hold this position for at least one (1) minute. The test is positive if the patient complains of numbness or tingling in the thumb, index finger, or middle finger. Tip #9 – Assess Range of Motion (ROM) – Cervical Spine. Assess the cervical spine for mobility. Note the movements of the neck. Assess for flexion, extension, rotation, and lateral bending of the cervical spine. ROM of the cervical spine. Have the patient stand in front of you with the head facing forward. Next, have the patient bend the head forward and touch their chin to their chest. Have the patient stand in front of you with the head facing forward. Next, have the patient look at the ceiling. Have the patient stand in front of you with their head facing forward. Next, have the patient look over their shoulder toward one side then the other. Have the patient stand in front of you with their head facing forward. Next, have the patient bring their ear to their shoulder on one side then the other ear to the other side. 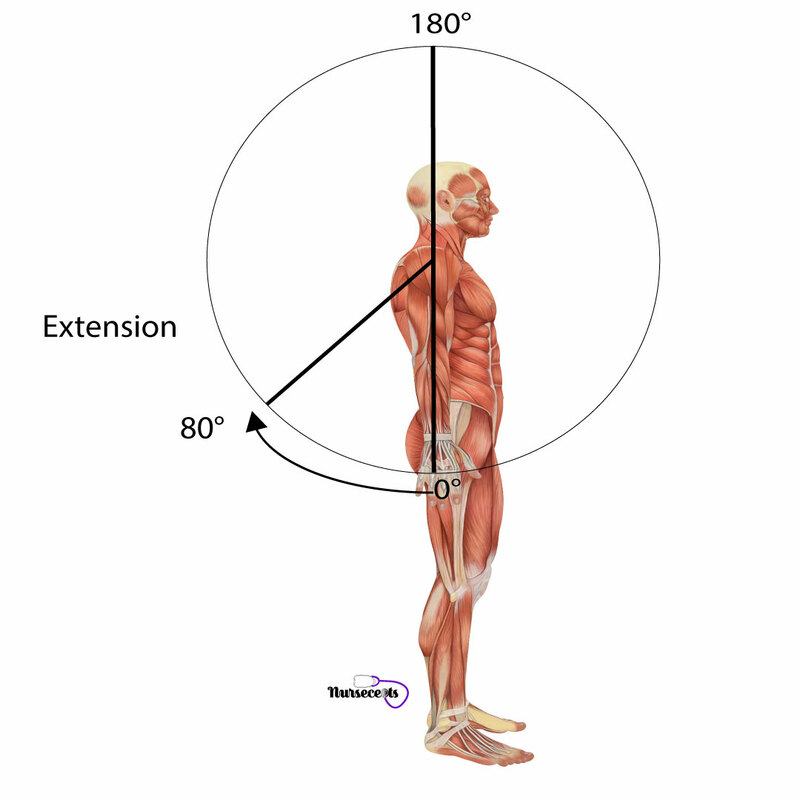 Tip #10 – Assess Range of Motion (ROM) – Spinal Column. ROM of the spinal column. Assess the mobility of the spinal column. 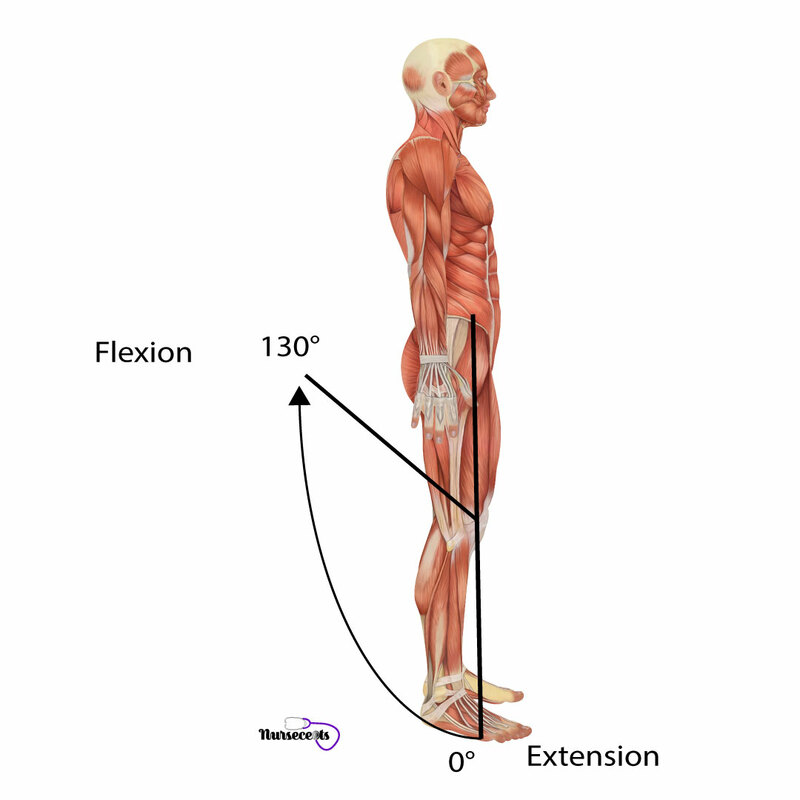 Assess the movements of flexion, extension, rotation, and lateral bending. Have the patient bend forward and touch their toes without bending the knees. The movement should be smooth and symmetrical. Assess the lumbar spine are any deformities. Assess to see if the curvature in the lumbar spine flattens out. Have the patient bend backward from a standing position as far as possible. Support the patient while performing this maneuver. Assess for decreased mobility or pain with movement. Have the patient rotate the spine by turning side to side without moving their feet. Support the patient while performing this maneuver. Have the patient turn to one side then the opposite side as far as possible for that patient. Have the patient bend from side to side at the waist. Support the patient while performing this maneuver. Assess for decreased mobility. Do not force the patient further than they are capable of bending with any of these movements. Tip #11 – Assess Range of Motion (ROM) – Hip. Assess the range of motion of the hips. 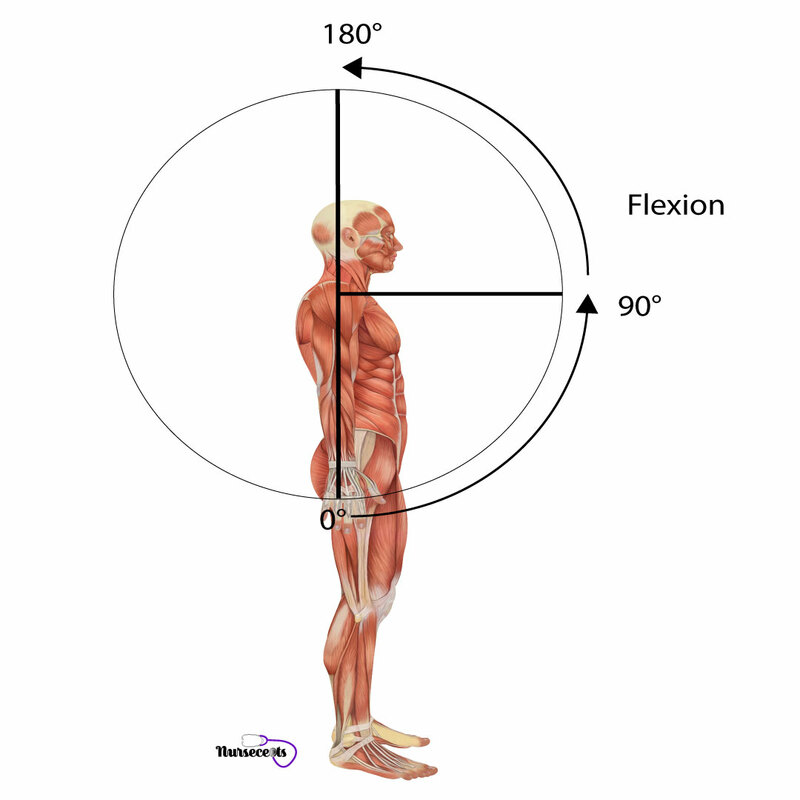 Test the movements of flexion, extension, abduction, adduction, external rotation, and internal rotation. To perform an assessment of the hip, place the patient in a lying position. Begin with the patient in a supine position or lying on their back. Place the patient in a supine position (on their back). Place your hand under the patients back at the lumbar spine. Have the patient raise the leg with the knee extended or a straight leg. 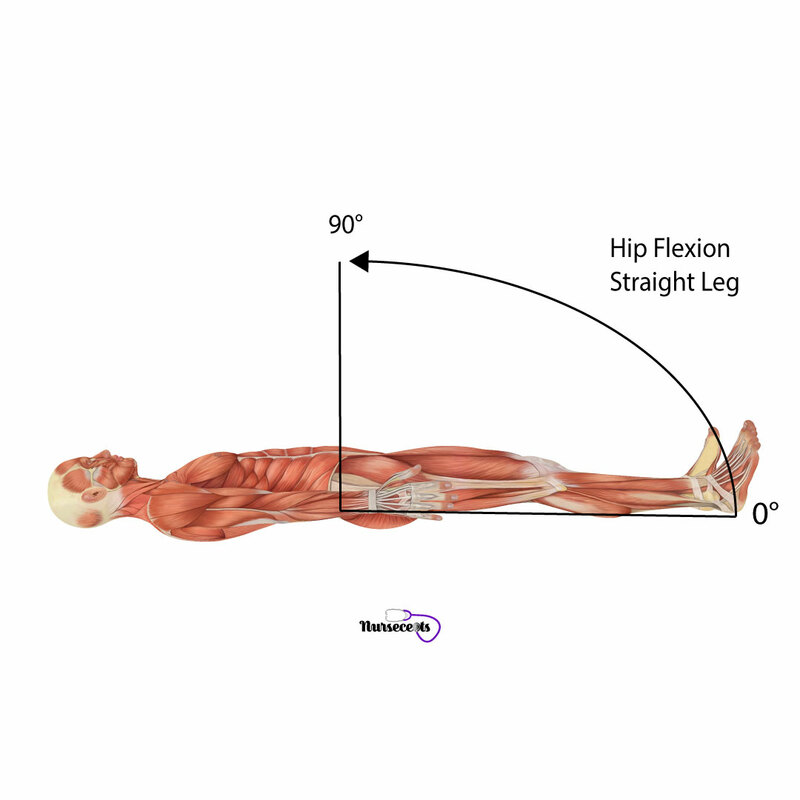 This is hip flexion of 90 degrees. Observe the opposite knee to see if it remains extended. The opposite knee should remain flat. Place the patient in a prone position (on their stomach). Assist the patient in lifting their leg posteriorly. Assess the amount of extension in the hip. Place the patient in a supine position or have the patient in a standing position. Have the patient move their leg away from midline to the side. Limited abduction could indicate a problem with arthritis of the hip. Place the patient in a supine position or have the patient in a standing position. Have the patient move their leg toward the midline. Place the patient in a supine position and have them bend their knee. Have the patient move their foot away from the midline as the knee moves toward the midline. Place the patient in a supine position and have them bend their knee. Have the patient move their foot toward midline as the knee moves away from the midline. Tip #12 – Assess Range of Motion (ROM) – Knee. Assess the range of motion of the knee. 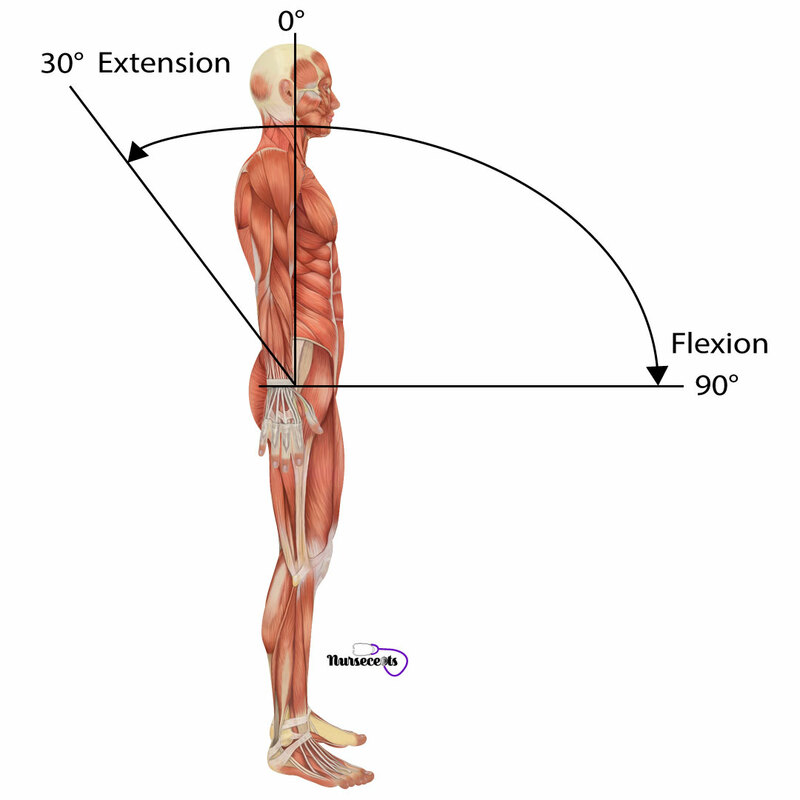 Test the movements of flexion, extension, internal rotation, and external rotation. Have the patient bend the knee or squat. A problem with bending the knee could indicate arthritis or an injury. Have the patient straighten the knee from a bent position or rise up from the squat. A problem with moving from a bent position to an extended position can also indicate arthritis or an injury. Place the patient in a sitting position. Have the patient swing the lower leg toward the midline. Place the patient in the same sitting position. Have the patient swing the lower leg away from the midline. Tip #13 – Assess Range of Motion (ROM) – Ankle and Foot. Assess the range of motion of the ankle and foot. 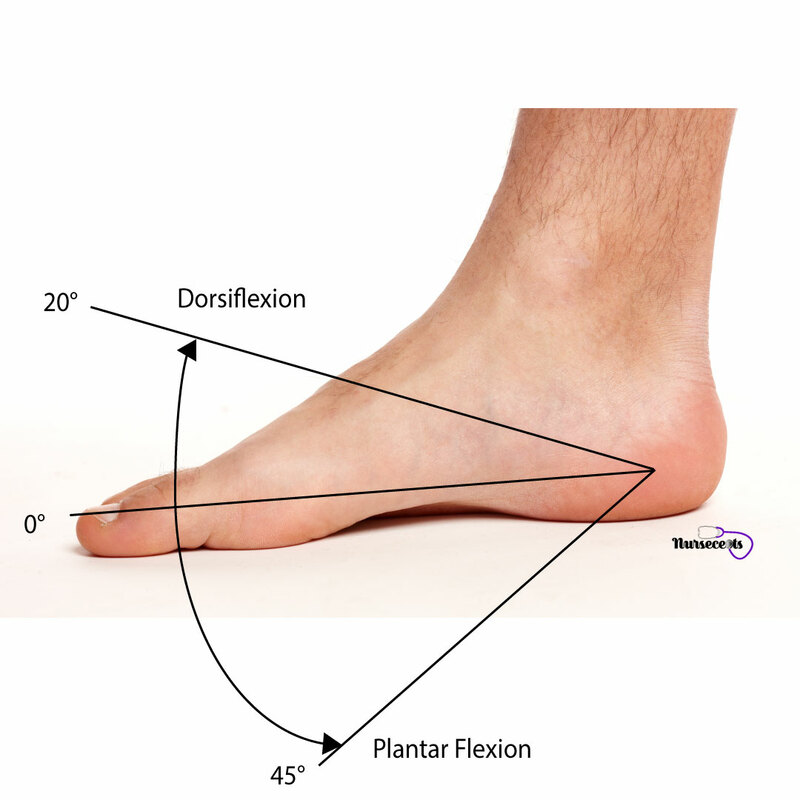 Assess the movements of plantar flexion, dorsiflexion, inversion, and eversion. Have the patient point their toes. Have the patient raise their toes toward the ceiling. Have the patient bend their heel inward toward the midline. Have the patient bend their heel outward away from the midline. 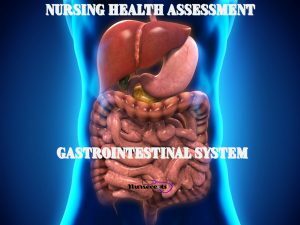 In conclusion, the tips above will help you with a nursing health assessment of the musculoskeletal system. For this nursing assessment, you will use the skills of inspection, palpation, and the assessment of range of motion. 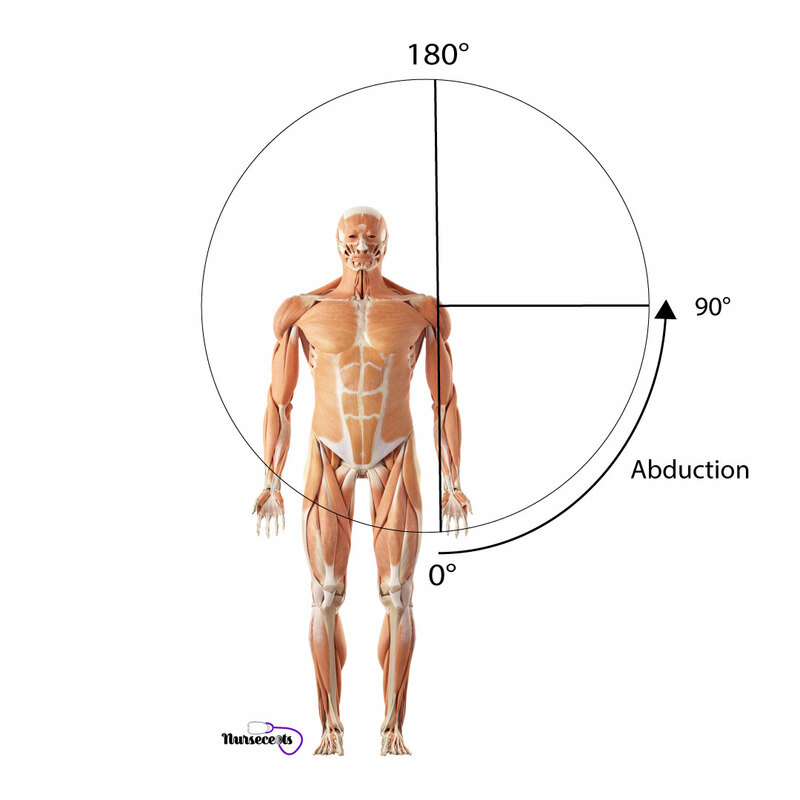 Assessment of the musculoskeletal system will help you identify any problems a patient may have with movements and performing activities of daily living. 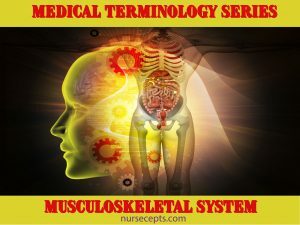 Also, for more information about the musculoskeletal system read the articles 7 Facts About the Musculoskeletal System Every Nursing Student Should Know and 9 Facts About the Skeletal System Every Nursing Student Should Know. Previous Post9 Facts About the Skeletal System Every Nursing Student Should Know.